Warped pickets and splitting rails are a thing of the past with Affordable Exterior's Aluminium, Vinyl and Composite Railing Systems. Our low-maintenance railing is designed for flat and stair applications. Choose from a variety of railing styles that will add the finishing touches to your deck, balcony, porch or patio, to create the enduringly beautiful appearance your home deserves, without sacrificing durability and strength. 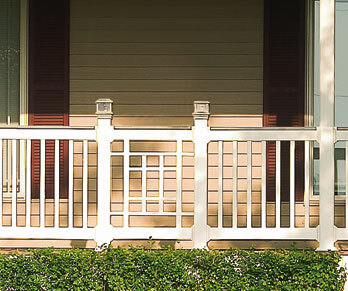 The classic looks of a traditional wood railing system without the maintenance. Safe, Stylish railing, available in several colors.